The daguerreotype photography process was discovered almost simultaneously by two inventors, Louis Jacques Mande Daguerre in France and William Fox Talbot in England. Daguerre's method became more widely used. Talbot eventually created the calotype. Calotypes do not feature the sharp definition of daguerreotypes. Also, the prints tended to fade, unlike the daguerreotype. The daguerreotype method was invented in the 1830s by Daguerre, a French painter and physicist. He discovered that exposing an image onto a copper plate coated with iodized silver would produce a lasting image if it was also exposed to mercury vapor and fixed with a common salt solution. Later, other vapors were used. Daguerreotypes are captured on polished silver, making it reflective, like a mirror. Daguerre collaborated with Joseph Nicephore Niepce, but Niepce died by the time the first daguerreotype was produced in 1837. The method was unveiled in 1839 and became popular, especially in the United States. Talbot moved on to another photographic process in which photographic paper was brushed with a salt solution, dried, then brushed with a silver nitrate solution and dried again, creating a silver chloride. Talbot then added gallic acid, making the paper more sensitive to light. After exposure, the image was fixed with another iodized solution. To make a print, the negative was placed on top of more photo paper, laid flat in a glass frame and allowed to develop in sunlight. Talbot patented this process in 1841. The daguerreotype method is considered the first practical photographic process. Exposure time dropped from hours to minutes. However, it did not have the capacity for duplication. 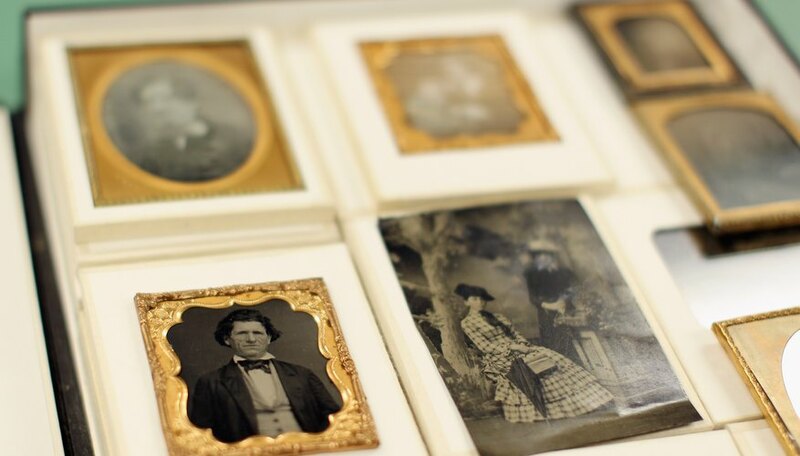 The ambrotype process, developed in 1861, rendered both the daguerreotype and the calotype obsolete. A daguerreotype is a negative image, but the mirrored surface of the metal plate reflects the image and makes it appear positive. Since silver daguerreotypes could tarnish, they were put behind glass and sealed with paper tape, then placed in a hinged case. The calotype negative, like typical negatives, had light and dark tones reversed. Unlike the daguerreotype, an unlimited number of prints could be made from one calotype negative, making it a forerunner of modern photography, in that the process created both negative and positive images. Talbot’s acquaintances called the calotype a Talbotype.